BACKGROUND AND PURPOSE: On MR imaging and CT, Japanese encephalitis (JE) shows lesions in the thalami, substantia nigra, basal ganglia, cerebral cortex, cerebellum, brain stem, and white matter, whereas temporal lobe involvement is characteristically seen in Herpes simplex encephalitis (HSE). Temporal lobe involvement in JE may cause problems in differentiating it from HSE. We undertook this study to show the temporal lobe involvement pattern in JE and highlight differentiating features from temporal lobe involvement in HSE. METHODS: Sixty-two patients with JE underwent CT or MR imaging or both. MR imaging was done in 53 and CT in 53. The diagnosis of JE was confirmed by cerebrospinal fluid (CSF) IgM enzyme-linked immunosorbent assay. RESULTS: Eleven (17.7%) patients showed temporal lobe involvement with abnormal MR imaging in all. All the patients showed hippocampal involvement. Two patients showed extension of lesions into the amygdala and uncus with insular involvement in 1. The rest of the temporal lobe was spared. All patients had thalamic and substantia nigra involvement with basal ganglia involvement in 7. Six of 9 CT scans were abnormal and the temporal lesions were seen in 2. CONCLUSIONS: The temporal lobe involvement pattern is fairly characteristic and mostly involves the hippocampus, usually sparing the rest of the temporal lobe. This and the concurrent involvement of the thalami, substantia nigra (SN), and basal ganglia allow differentiation from HSE. However, if the temporal lobe involvement is more severe, laboratory tests may be the only way to differentiate it from HSE, and it may be prudent to start antiviral therapy in the interim period. 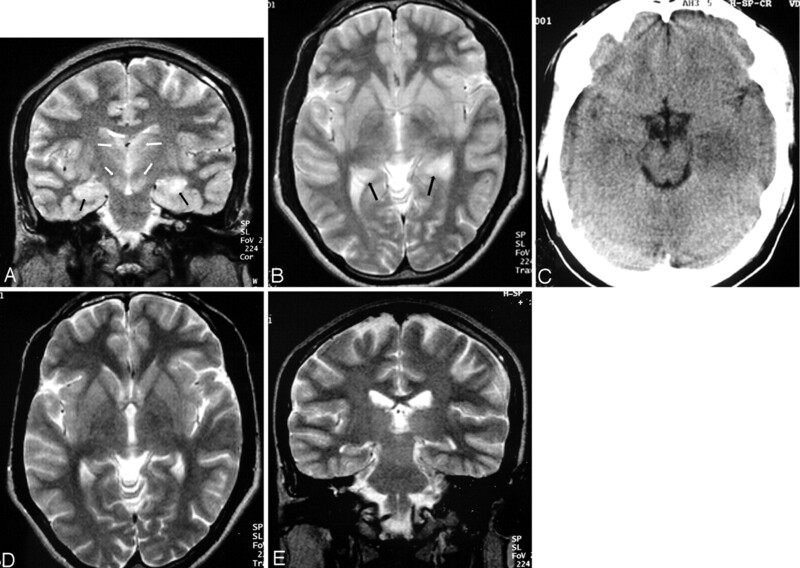 The MR imaging and CT findings of JE have been described as bilateral thalamic, substantia nigra, basal ganglia, brain stem, cerebellum, cerebral cortical, and white matter lesions.3–5 Bilateral T2 hyperintense and T1 hypointense to isointense thalamic lesions, especially hemorrhagic have been described as characteristic in an appropriate clinical setting.4 These lesions differentiate it from Herpes simplex encephalitis (HSE) that characteristically shows bilateral or unilateral T2 hyperintense lesions in the temporal lobes with or without hemorrhage and contrast enhancement.6,7 While scanning patients with JE in our Institute, we noticed that temporal lobe involvement could often be seen in these patients, leading to a problem in differentiating these patients from those with HSE. Because specific antiviral therapy reduces mortality in HSE, this differentiation is important.8 Although known, temporal lobe involvement has not been highlighted in imaging literature. We undertook this study to show temporal lobe involvement in JE and highlight differentiating features, if any, from temporal lobe involvement in HSE. Sixty-two patients with JE who presented to our Institute in the months of June 2000 through August 2003 had undergone CT or MR imaging or both. MR imaging was done in 53 and CT in 53. Prospective analysis of these scans showed temporal lobe involvement in 11 (17.7%) patients besides lesions elsewhere in the brain. All 11 patients were examined by MR imaging. CT was done in 9 patients. There were 3 female and 8 male patients between 8 and 58 years of age. All presented with fever followed by altered sensorium of short duration. Cerebrospinal fluid (CSF) examination revealed raised protein and lymphocytic pleocytosis in all. The diagnosis was confirmed by positive immunoglobulin M (IgM) antibodies to JE virus (JEV) in the CSF by IgM capture enzyme-linked immunosorbent assay (MAC-ELISA). All patients had more than or equal to 100 MAC-ELISA units for JEV in the CSF, which was taken as positive for IgM antibodies as described by Burke et al.9 Herpes simplex virus (HSV) IgM and IgG ELISA tests in the CSF of all 11 patients with temporal lobe involvement were negative. MR imaging of the head was performed by a Magnetom Impact 1T scanner (Siemens, Erlangen, Germany) in all cases. Sedation was used where necessary. T1-weighted spin echo (repetition time [TR] 600, echo time [TE] 15) and T2 turbo spin echo (TR 3500, TE 90) images were obtained in the axial, coronal, and sagittal planes by using 1 or 2 acquisitions. Section thickness used was 4 mm. No intravenous gadolinium was used. Plain and contrast CT examination was done on a Somatom scanner (Siemens) taking 5- to 10-mm contiguous sections. MR imaging and CT examinations were done in 10 patients in the acute phase of their presentation. One patient had the CT scan done at 16 days and MR imaging at 27 days after onset (Table 1). Four patients had follow-up MR imaging in the convalescence period and one had a follow-up CT. The MR imaging and CT scan films were evaluated by 2 neuroradiologists for the location, signal intensity/attenuation, contrast enhancement, associated mass effect, or cerebral swelling. All 11 patients had abnormal MR imaging scans. On MR imaging, the lesions appeared hyperintense on T2-weighted and isointense to slightly hypointense on T1-weighted images. No intravenous gadolinium was given. There was bilateral temporal lobe involvement in 8. Three patients showed unilateral involvement. All the patients had medial temporal lobe involvement, predominantly involving the hippocampi. The hippocampal involvement was most commonly in the tail and body with all 11 patients showing either unilateral (3) or bilateral (8) tail and body involvement. The hippocampal head was involved in 7 (Fig 3A). There was anterior extension to involve the amygdala and uncus in 2 (Fig 3). 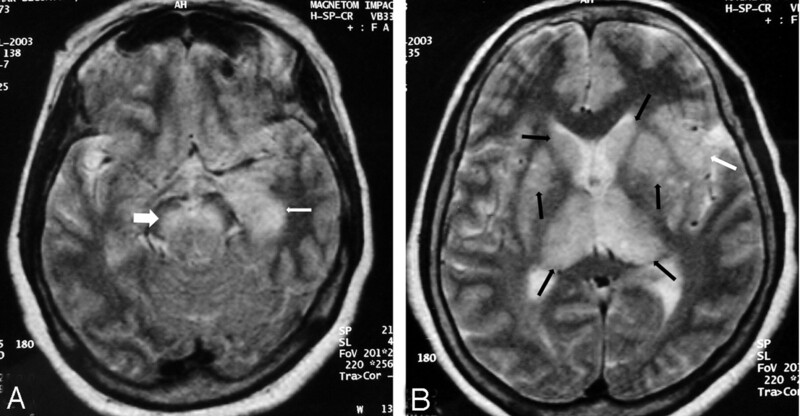 The insula was involved in one patient (Fig 3). All the patients had associated thalamic (bilateral = 10, unilateral = 1) and substantia nigra (bilateral = 10, unilateral = 1) involvement (Figs 1, 3, and 4). Basal ganglia involvement was seen in 7, all bilateral (Figs 2 and 3). In the 4 patients who had follow-up MR imaging, there was mild residual hippocampal lesion in 1 and complete resolution of all lesions in the other 3 (Figs 2 and 4). A, T2-weighted axial image: bilateral thalamic lesions (black arrows). Note left hippocampal tail involvement (white arrow). B, T2-weighted coronal image shows bilateral thalamic (black arrows), substantia nigra (white arrows), and left hippocampal body involvement (large white arrow). C, Image more posterior than B shows hippocampal tail involvement on the left side (arrow). D, Axial T2-weighted image shows bilateral substantia nigra lesions (arrows). A, Axial T2-weighted image. Lesions are seen in both caudate heads and thalami (arrows). B, Coronal T2-weighted image shows bilateral hippocampal body involvement (arrows). C, Axial T2-weighted image shows the lesions involving the hippocampal tails (arrows). Note lesions in the caudate heads (white arrowheads). D, Axial T2-weighted image done 3 months after C shows resolution of the hippocampal tail lesions (arrows). The caudate head lesions have resolved (white arrowheads). E, CT scan done in the acute stage shows brain swelling and bilateral subtle thalamic lesions (arrows). The hippocampal and basal ganglia involvement was not apparent on this CT scan (not shown in the figure). F, Follow-up CT scan, done 3 months after E, shows reduction in the edema and resolution of thalamic lesions. A, Axial T2-weighted image shows left hippocampal head and body involvement (arrow). There is extension into the amygdala. Note bilateral substantia nigra lesions (large white arrow). B, Axial T2-weighted image shows bilateral thalamic and basal ganglia lesions (black arrows). Note left-sided insular involvement (white arrow). A, Coronal T2-weighted image shows bilateral hippocampal body involvement (black arrows). Note bilateral thalamic and substantia nigra involvement (white arrows). B, Axial T2-weighted image shows bilateral hippocampal tail involvement (arrows). C, Axial CT scan done at the same time as A and B shows hypoattenuated left mesial temporal lobe lesion. Note resemblance to Herpes simplex virus encephalitis. The right-sided involvement is not seen. The thalamic and substantia nigra lesions are not visible (not shown in the figure). D and E, Follow-up axial and coronal T2-weighted MR done 2.5 months after A and B shows clearing up of the lesions in thalamus, substantia nigra, and hippocampus. Six of 9 patients had an abnormal CT (one showed only edema). On CT, the lesions, when seen, were hypoattenuated and showed focal swelling and no contrast enhancement. Only 2 patients showed the temporal lobe lesions (Fig 4C). Associated thalamic lesions were seen in 4 (bilateral = 2, unilateral = 2) (Fig 2E). Bilateral basal ganglia lesions were seen in 1. Two patients showed cerebral swelling (Fig 2E). The findings are summarized in Tables 1 and 2. Eleven of 62 (17.7%) patients with JE in our study showed medial temporal lobe involvement, a finding more characteristic of HSE. A characteristic temporal lobe involvement pattern was noted. The lesions involved the posterior part of the hippocampus, including the tail and body, in almost all the patients. Anterior extension to the head, uncus, and amygdaloid body was occasionally noted. The rest of the temporal lobe was generally spared. In only one patient did the extension of disease involve the insula, with the neocortex being spared. Some imaging studies have found temporal lobe involvement in patients. Six of 10 patients had temporal lobe involvement in one study.11 In another, only one patient of 43 showed temporal lobe involvement.3 These studies, however, have not elaborated on the nature of temporal lobe involvement in their cases. The JE virus invades the nervous system through the hematogenous route, though subsequent spread of the virus seems to occur along the dendritic axonal processes.10 There is often sharing of blood supply by parts of the thalamus, cerebral peduncles, hippocampus, and uncus, mainly through the anterior choroidal, lateral posterior, and medial posterior choroidal arteries.14,15 These arteries have reciprocal vascular supply. This may explain concurrent involvement of the medial temporal lobe along with the thalami and substantia nigra in our patients. On the other hand, there may have been contiguous spread to the posterior hippocampus from the thalamus, once the latter was infected with the virus. The HSE virus gains entry into the brain through the sensory cranial nerves and most commonly spreads through the small meningeal branches of the trigeminal nerve. Bilateral anterior and medial temporal lobe involvement is therefore the hallmark of this disease. MR imaging shows the unilateral or bilateral anteromedial temporal lobe involvement, which is hyperintense on T2 and hypointense on T1-weighted images. Orbitofrontal involvement is common. The insula, amygdala, and cingulate gyrus are commonly involved, whereas occasionally there may be infection of the basal ganglia.6,8,16 Thalamic or brain stem involvement is not common. There is therefore some overlap of the site preference of the JE and HSE lesions. 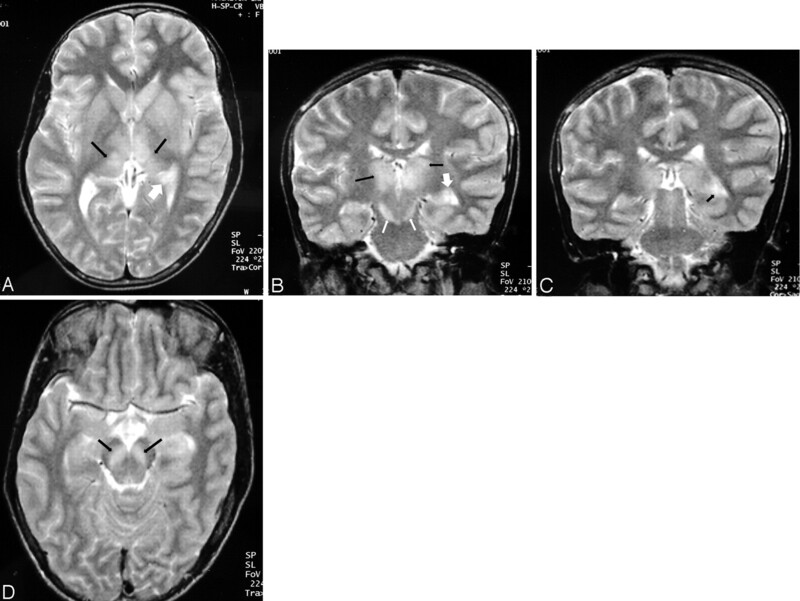 With the presence of temporal lobe involvement in the clinical setting of acute viral encephalitis, lesions typical of JE in the thalami, SN, and basal ganglia helped us differentiate JE from HSE in these patients. The temporal lobe involvement pattern in JE was different from that in HSE; the posterior hippocampus was commonly involved in all our patients. The anterior temporal lobe was usually spared and insular involvement was rare, unlike HSE. The temporal neocortex was spared. It is possible, however, that a more virulent strain of the JE virus may involve other areas of the temporal lobe by contiguous spread, when the involvement pattern may resemble that of HSE and differential diagnosis may be a problem. Other uncommon conditions may also involve the temporal lobe similarly in imaging studies. They include paraneoplastic limbic encephalopathy, lupus erythematosus, Hurst hemorrhagic leukoencephalitis, and neurosyphilis.17–20 These conditions, however, do not mimic JE clinically. 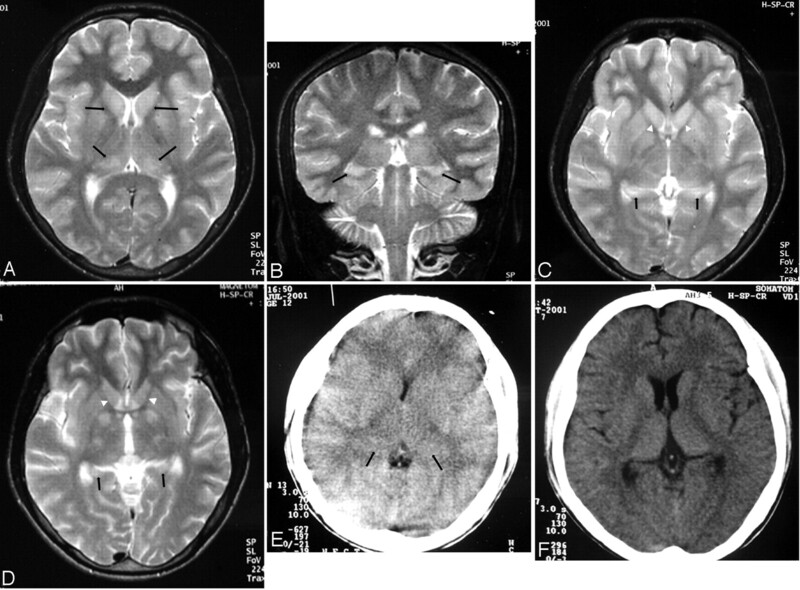 Acute encephalitis with CT and MR imaging findings showing bilateral thalamic, medial temporal lobe, and hippocampal lesions (like JE), besides lesions elsewhere in the brain, has been reported from Korea.21 No causative agent could be identified in these patients. In conclusion, although thalamic, SN, and basal ganglia lesions are characteristic of JE, temporal lobe involvement may also be seen. The temporal lobe involvement pattern seems to be fairly characteristic with involvement of the hippocampus (more commonly, the body and tail). The rest of the temporal lobe and insula are usually spared. This and the concurrent involvement of the thalami, SN, and basal ganglia allow differentiation from HSE. However, if the temporal lobe involvement is more extensive, as demonstrated by our patient 7 (Fig 3), laboratory tests may be the only way to differentiate it from HSE, and it may be prudent to start antiviral therapy in the interim period. Accepted after revision September 30, 2005.